Honored to be among the contributing artists—a pretty impressive list of DFW names (like Texas Country legend Pat Green)—for this year’s Studio 212 fundraiser, benefiting the West Dallas Community School. Purchase tickets and learn about this great cause in the link above! Summer is my favorite season. I’m all about hot weather, more daylight, more barbecues, watermelon 24/7, everything revolving around swimming pools, being outside at night, and awesome thunderstorms. I love summertime because it’s a season of intense activity. There is another side of summer, to me: a season of intense pain. I’ve struggled with chronic migraines since I was a little kid, and in recent years, they’ve taken a sharp uptick in frequency and severity—especially in the hotter months. A couple years ago, for the better part of the summer, I was plagued by excruciating migraines on nearly an everyday basis. I had more days with them than without, despite the amount of care I was putting into my diet, exercise routine, sleep schedule, mental health, etc.. That summer was the most tangible encounter with defeat I had ever had. If you’ve experienced a migraine, you might get what I mean by “defeat”. You might even get what it’s like to go temporarily blind, or be sick to your stomach from the pain, or lose the ability to speak in coherent sentences, or spend your savings on doctor visits and medicines, or miss out on work, school, and special occasions—while feeling a warped sense of shame around forgoing those things to go lie in a dark room indefinitely. Even so, my battle with migraines taught me that there is beauty in suffering defeat. Like a powerful tempest plowing over a submissive landscape, each migraine episode is devastating, but somehow, dignifying. When the earth is beaten by the storm, it changes its shape. It recovers, with a richer history and more fertile soil than before. As a quintessential harbinger of defeat, the storm has become a lens through which I view my suffering. Every time a migraine breaks me down, it actually creates a more whole version of myself. This series of summer storm paintings is emblematic of life’s overwhelming forces, and the idea that victory lies not in conquering the storm, but rather in rising from the defeat. Rewinding a little bit—to the middle of May. Summertime was coming in hot, and Mason and I were persuaded with a sudden opportunity to relocate from Austin to Dallas by the end of the month. I took that time to hit pause on the Icelandic terrain series I’d been working on in order to focus on the move, yet the rest of my life felt like it was in fast forward. In the midst of the shuffle, I was contacted about a commission idea that had me raring to get started as soon as we moved in. It was a custom painting of a lightning storm, echoing the moody Cloudscapes series I’d produced just a couple years ago. I had so much fun working on this piece; not only was I happy to be settled in my new Dallas studio, but I could feel a sense of familiarity and confidence building as I tapped into the surrealism of storm clouds and lightning bolts once again. While I’d originally planned to wrap up the Iceland series asap, things changed after this commission. I’m feeling a summer storm series coming on, and we will see where it blows. Missed out on the last painting class did ya? Well you're in luck! I'll be teaching another Acrylics 101 workshop at CRAFT on June 10! Learn the basics of color theory, brushwork, and how to paint your own floral still life. I can't think of a better way to escape the summer heat. Get tickets ASAP! DALLAS!!! April is Arts Month and I am thrilled to join the international celebration in your city. Steal a visit to the Women's Museum building in Fair Park, where my Milky Way paintings will be on display alongside the works of an impressive roster of Texas-based female artists at the Vignette Art Fair, 4/10-15. The public opening is Friday, April 13, 7-10pm. Learn more about the curators, artists, and events at www.texasvignette.org, and check out this article in Arts+Culture for further details. Attn ATX: I will be teaching an acrylic painting workshop on May 5, hosted by the awesome women at CRAFT! We’ll get to paint floral still life pieces of our very own, whilst enjoying drinks and snacks and creative conversation. Whether you're a beginner or a master, this class is designed to be fun, fresh, and educational for all skill levels. Hint: Mother’s Day is right around the corner and I bet she’d love some artwork made by her Pride and Joy (that’s you!). Get tickets HERE! In case I don’t talk about it enough (YEA RITE), I wanted to share a little more about my residency in Iceland, especially with regards to the latest series of atmospheric landscape paintings emerging from it. Iceland has always been at the top of my bucket list. There are few places like it on Earth, which is why it was so alluring to begin with; there’s really nothing "earthly" about it. To someone as infatuated by the existence of strange worlds in outer space as I am, a trip to Iceland seems as close as it gets to an exoplanetary expedition. The volcanic landscape is encrusted with bizarre textures, the skies are vibrant and ever-changing. The air feels unfamiliar (i.e. fresh) and it’s eerily quiet. There is color everywhere, even when snow and ice cover everything in sight. I got to create a lot of work during my residency, and knew that there would be more to come once I returned home. But, I could not have predicted that the hardest part would be choosing which of the thousands of photos taken from my journey would become subject matter, while trying not to be too critical of their comparability (or lack thereof) to the real thing. Indecisiveness and insecurity aside, as soon as I started painting, I was instantly reconnected to all those powerful memories from my time there: the golden afternoons, pensive walks, sunrises, mountainsides, whiffs of sulfur, and perfect solitude. When I think about what I want to get out of this series, that’s all I could ask for—to honor the memories and lessons from being in such a unique place, and in doing so, to be washed with gratitude for them. I think there’s something distinctly human about that. It stirs the spirit of curiosity and adventure inside all of us, something I’ve always found mesmerizing about human beings, something my work has always been about. Turns out, experiencing Iceland was a means to living out that idea for myself. Eventually, I’ll return to painting the stars. I already kind of miss it. But it’s important to see how this series will impact future work, and to give it my time and energy and my whole heart. I owe it to Iceland. I spent the month of November living and working in a small village near the base of the highlands in the Icelandic countryside. I had high expectations for the work to be accomplished in my little studio there, but never could have anticipated the way the etherial terrain, long shadows and short days, ever-changing light, and the goodhearted Scandinavian culture would envelop my mind, body, and spirit. Life in Iceland felt right. Snowfall had arrived by the second week, transforming the richly colorful landscape into a winter wonderland. Earth tones shifted to pastels: blue, pink, lavender, tangerine, and mint green. No matter the weather, the light was always showing off, continually transforming the horizon. And then, the Aurora appeared! Seeing the Northern Lights in person was a profoundly joyous thing, prompting me to describe their mystique with more enthusiasm than anything I’ve ever brought into the studio before. There’s something especially satisfying about painting from personal experience, even more so when it’s one you’ve dreamed of for so long. I created over 70 paintings and drawings during the residency, but still felt the time to pack them up came too soon. Fortunately, I had the chance to do some supplementary exploring and documenting when my mom stopped over for a few days, and when Mason joined me in early December. We spent 9 days driving around the Southeast coast, hiking up waterfalls, strolling through lava fields, and flying the drone over glacial and geothermal terrain. I found myself greedily straining to retain all the jaw-dropping visual data, anticipating the next spree of paintings and drawings that I’d get to knock myself out with when I unpacked it all back home. And on that note, the adventure continues! When attempting to describe just how transformative and valuable this experience was for me, there’s not much I can say to do it justice. I wish I could spell out every meaningful interaction, profound train of thought, and enchanting work of art and poem I came across, but it’s just not possible. So instead, I broke down as much as I could into a four-part synopsis. Part One gives a bit of background context for my taking this trip. Part Two explains what I was working on during my stay. Part Three is sort of a quasi-review of the program, to give you an idea of what to expect if you might be considering applying. And lastly, Part Four is an open-ended reflection on what I learned. I’m a homebody in every sense of the word. I treasure the people, places, and rituals that fill me with a sense of belonging. I’ve never had to let go of the stuff that represents my home: the city in which I grew up and settled down, the man I married, the family who raised me and sent me into the world (always welcoming me back), the friendships forged here, the food I prepare on weeknights, the neighborhood streets where I jog and wave to kids on scooters, the Netflix shows I binge continuously, the sunny porch where I can read and watch my dog run around. These things are so special to me, that their importance often outweighs my desire to branch out. Recognizing this fragility in myself, I felt it was time to take a journey. I applied to this residency at the Vermont Studio Center in the hopes of gaining wisdom, exposure, and the courage to grow and improve as an artist. I wasn’t prepared for how much I would long for home, and how weak that longing would make me feel at times. But I also wasn’t prepared for how much stronger I would begin to feel as an outcome. My main goal going in to the residency was to make the most of my time, and live in the present. As one of those planner/dreamer-types, I knew this would be a challenge. But I found the best of both worlds by organizing what I wanted to work on before I left for Vermont, so once I arrived I could capitalize on the time and resources available. With the hope of pushing my night sky paintings deeper, I thought: “Why not actually go deeper?” and immediately hopped onto the NASA database to ogle some deep space photography. That was where it first occurred to me to research globular clusters. I became obsessed with these stellar objects, which have been extensively catalogued and studied for centuries. I envisioned a gallery wall filled with hand-painted star clusters, suspended, staring you down. I liked that image, and that was enough for me to decide on what I would be painting during my residency. Over time, the renderings of these globular clusters felt more like portraits of specific individuals. They were about the same size as a person, and could be characterized by their densities, their youth, their warmth, their mystique--like their own personality traits. The subject matter was becoming even more enchanting to me as the process continued. So why am I painting them? It’s a question with several answers, all of which share a common thread weaving through the balance of Real and Ideal physics. I am captivated by the order and symmetry of the universe; my infatuation with painting the stars feels analogous to a school girl scribbling the portrait of her crush all over her notebook. Ironically, my obsessive interpretations of cosmic beauty will never come remotely close to capturing the actual purity and splendor and greatness of the universe. But I am compelled to attempt again and again. Simply put, I’m in love, and love makes you do crazy things. *This section mainly applies to any readers who might be interested in enrolling at the Vermont Studio Center. Feel free to skip ahead to Part Four! Besides studio visits, meal times, slideshows, and readings, scheduling your day is up to you. Nothing is mandatory, no one is looking over your shoulder. All of the staff members are artists or writers themselves. It took a day or two to settle in and get oriented, but eventually I found a suitable rhythm, and life in the small town of Johnson, Vermont started to progress. Breakfast, lunch, and dinner are included in the residency fee, which is not only cost-effective and beneficial to general health, but it’s also a huge time saver. The dining windows are brief, to accommodate the busy kitchen staff and encourage residents to enjoy a meal together. I thought the food was fantastic. As someone who avoids lots of foods to prevent migraines and other health problems, something I was worried about before coming was whether or not I’d be able to find things to eat. Thankfully, our meals frequently featured gluten-free, dairy-free, and vegetarian options, as well as a full salad bar for lunch and dinner. There’s a grocery store down the street where you can find plenty of fresh food options and snacks if you have serious dietary restrictions--in which case I would recommend calling in ahead of time to request staying in a house with a fridge/kitchen area so you can properly store the food you buy. There are several different buildings on the campus for housing. The private bedrooms are simply furnished, and the bathrooms are communal. Everything is cleaned regularly by a maintenance crew. The houses don’t have wifi, and I was pleasantly surprised that I liked it that way. I was glad I brought some books and a journal with me. Hot tip: Definitely pack a large water bottle or thermos. Your unavoidably dehydrated self will thank me. There is no AC on campus, so if you visit in warmer months, the sooner you can fill out a maintenance request for a fan, the better. In the winter: blankets on blankets. During my stay in June, it was often rainy and sunny in the same day, with occasional heat waves in the 90s and cold snaps in the 50s. I would encourage any future residents out there to pack clothing for every kind of climate, unless you’re going in the winter, when it’s pretty much consistently frigid and snowy. Luckily, if you forget anything, praise the Lord for Amazon.com. Within walking distance are a laundromat, post office, hardware store, lumber yard, thrift shop, and a well-stocked art store, which is where I bought my solvents and canvas rolls. All the materials I packed in my suitcase were my oils, brushes, mediums, sketchbooks, pencils, pens, and gouache set, but several residents had specialty items that needed to be shipped separately. From my experience, shipping to and from VSC is straightforward and especially advantageous towards the end of your stay. The amount of work you end up making and sending back home is totally up to you. The studios do have wifi, and they are spacious, well-lit, and accessible 24/7. There are designated areas for brush washing and chemical cleaning. You can close the door and work privately or keep it open and see who stops by for a chat. One of the biggest perks of this residency is the visiting artist program. 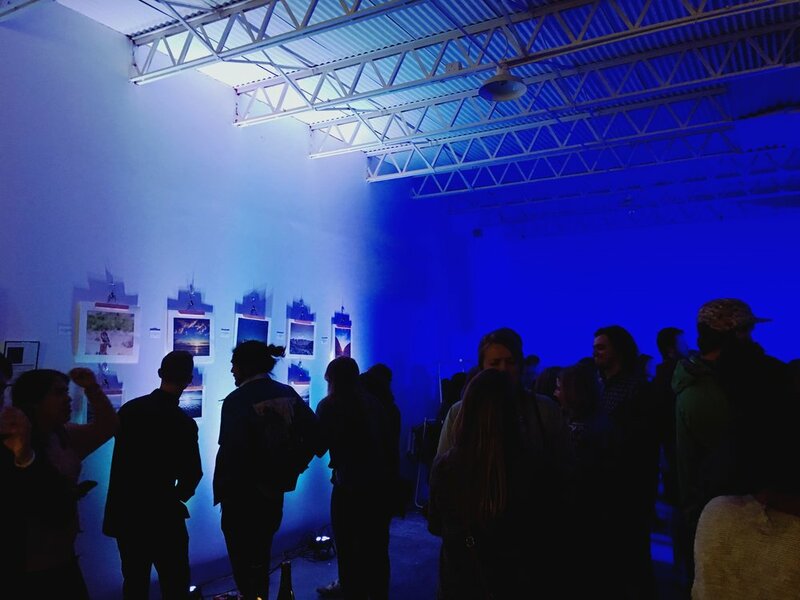 Each week, one or two well-respected artists/writers will be on site to give a presentation of their work and critique the work of the residents. I will spare you the obsessive notes I took from those visits, and underline the importance of making the most of the accessibility you’ll have to these brilliant minds. I also encourage you to sign up to present your own slide talk if you’re an artist or reading if you’re a writer, and to participate in the open studio nights. The feedback you’ll get from those opportunities is pretty astounding. If you want to check out the VSC website for more information on how to get there, what to do, and what to expect from the program, I’ve inserted a link here. This place had everything I could ever ask for and more. But I haven’t even gotten to the best part yet! More than anything, it was made overwhelmingly clear how important the aspect of community is at VSC. It was surprising how quickly I felt comfortable making conversation with everyone around me, especially for someone who would typically describe herself as an introvert. The group activities were my favorite moments from the trip, and looking back, I realize they impacted me much more than having a private workspace and ample resources and unlimited time in the studio. The times we were all together were the times when the really sentimental, profound, compassionate, good stuff was happening, like finding suggestions for various creative projects, hearing an emotional story from someone’s past, catching glimpses of human life that differs from your own. And the beauty of it is, no one ever seemed to think: “Who cares?” No matter your mood or personality--shy, gregarious, frustrated, joyful, inquisitive, confused, lonely, insecure, overconfident, content--the air was always peaceful, and the conversations were considerate and meaningful. I’m grateful I had this chance to diverge from the ordinary and be immersed in a different place for a while, where I could work without distractions and imagine without limits. I temporarily left one kind of privilege to enter into a different kind of privilege, and that's why I wanted to make the most of it so badly. My eyes opened to different vantage points, my fingers scribbled down every intriguing thought no matter how ridiculous, my skin got chills from an overload of inspiration, my back ached from long days, my conscious mind searched uncharted worlds, and my heart embraced new friendships. I am really going to miss everyone that I got to know over the course of those four weeks. I find myself mentally tracing over the imprint of this experience a lot, each time discovering new indications of what I took to heart. I can already tell it has made me more confident, more inquisitive, more daring, and more compassionate, and I have no doubts that I will continue to see progress resulting from my time at this residency for years to come. Exciting news! 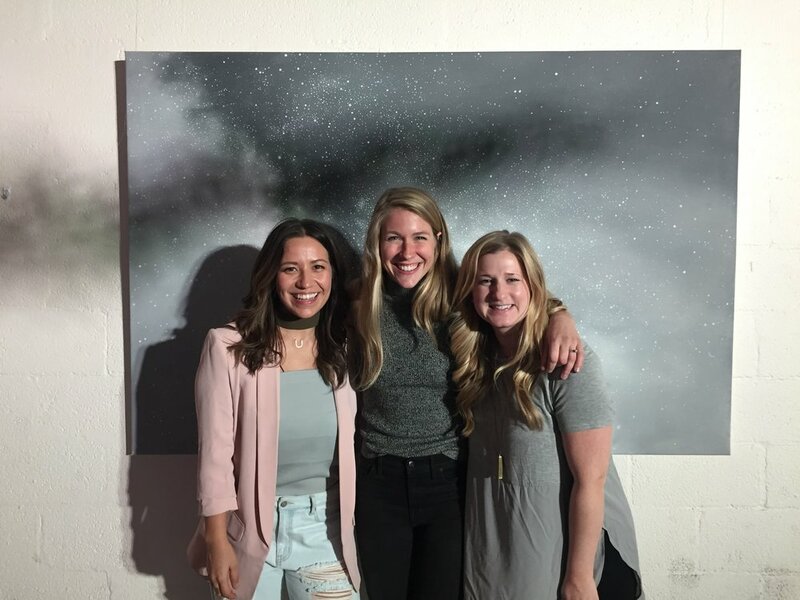 A special group of five original night sky paintings was curated for the Schoolhouse Electric spring collection. I am a HUGE fan of both this company and the handful of other artists bringing their incredible gifts to the Schoolhouse Art Studio. I feel honored, elated, and a little astounded that this is really happening. View the collection here! Kick off the 2017 West Austin Studio Tour with an opening party at the RW home studio! There will be snacks, drinks, art, and an artist talk at 8pm. Kindly RSVP to the Facebook event here. Come hang during WEST2017! My home studio (site #98) will be open to the public for two weekends, giving tour-goers rare opportunities to view what I've been working on, collect art at the source, and maybe even use our bathroom. You are also cordially invited to an opening party here at the studio on Friday, May 12, from 7-9pm. There will be snacks and drinks, and an artist talk at 8pm. Thanks to Big Medium for all their tremendous work! Visit west.bigmedium.org for more information about the tour. Working on "Night Sky No. 1"
About this time last year, my career underwent a major creative shift. From selling small, pastel-colored paintings of horses and cattle on my website, to building a collection of oversized, dark, cosmic works for my first public exhibition in a gallery, my artistic approach to everything started changing. I met Anne Raymond, a wise and wonderful painter in Manhattan, who advised me to make studio time as creative and focused as possible. Our conversation pushed me to dive deeper into a concept that could get me to stop worrying about what others would think about it. Surely there was something I could be painting that I would identify with beyond the surface level. The more I thought about it, the more I felt compelled to paint the stars. As long as I was doing that, others’ criticism or apathy no longer mortified me. Some close friends have told me they straight up don’t like space. And I was like: “That’s fine. Whatevs.” And I kept painting space. Since then, my work has evolved into an honest reflection of myself, echoing themes that I personally find significant, while aiming to awaken and empower the human spirit on an interpersonal level as well. I believe it's healthy to prompt ourselves from time to time to consider how small we are and how vast and beautiful the universe is, and to be grateful for the ability to pursue an understanding of it. This idea influenced everything: the way I view my work, my community, and even myself, and how I process through ideas and feelings on a day-to-day basis. The line between art and life started to soften and blur, then it faded away altogether. The concept engrossed me, and in the midst of it all, I have encountered a freeing, authentic creativity like never before. If you are in the Waco area please join me alongside some great artists and local businesses at Bolted + Brine, this Friday, Jan. 13, from 7-10pm. There will be art, music, performances, food and wine, and all-around cool people to interact with. I absolutely admire the vision Bolted + Brine has for this event AND for the lucky town of Waco, Texas. 324 6th Street. $5 cover. Go. ... And some other stuff to know. I have been working vigorously on a series of brand new paintings that embody my latest conceptual and technical approaches. It has been a challenging, illuminating process, and I am beyond excited to reveal the results in early 2017. So, next month, I will be remodeling my website, and all pieces currently displayed online will be removed to make room for a fresh collection of work for the New Year. 2016 has been unbelievable, thanks to your support! 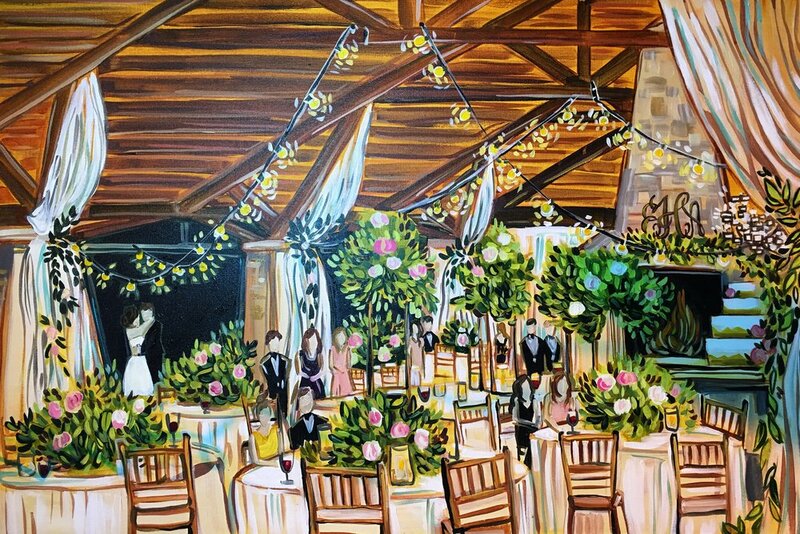 I had my first solo show and a couple pop-up shops, painted live at weddings and events, taught creative workshops, and worked on several special commissions. As a thank you, I am offering an epic, once-in-a-blue-moon discount of 40% off your total online order, until December 1st. Use the code THANKYOU16 when you check out, and be sure to follow me on Instagram for a chance to win an original painting! Hashtags, Boomerang photo booths, monogrammed selfie sticks, and custom Snapchat filters have pervaded the wedding world, introducing charming new ways to share memories from your special night. Amidst all the latest tech-y diversions and breaks from tradition, it’s pretty cool that a practice as long-established and seemingly archaic as painting is trending, too. 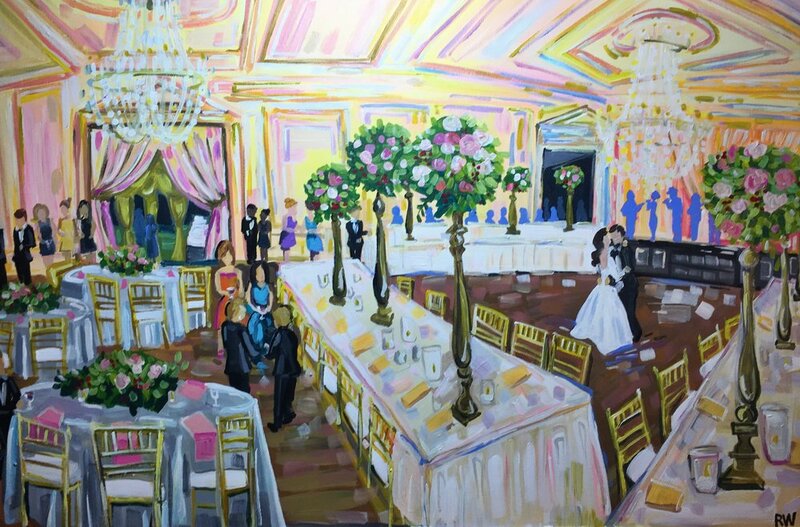 Live wedding painting creates a rare dynamic between the artist and observer, where they can engage with each other and the art itself in a spontaneous way--a distinguished mix of exhibition and entertainment. 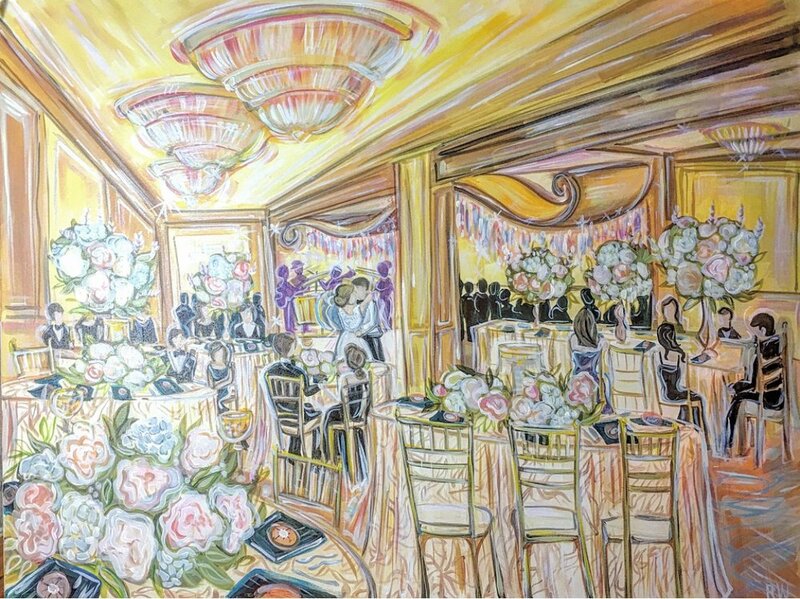 Guests can check on the painting's progress as the night goes on, and witness the scene on the canvas developing over time. 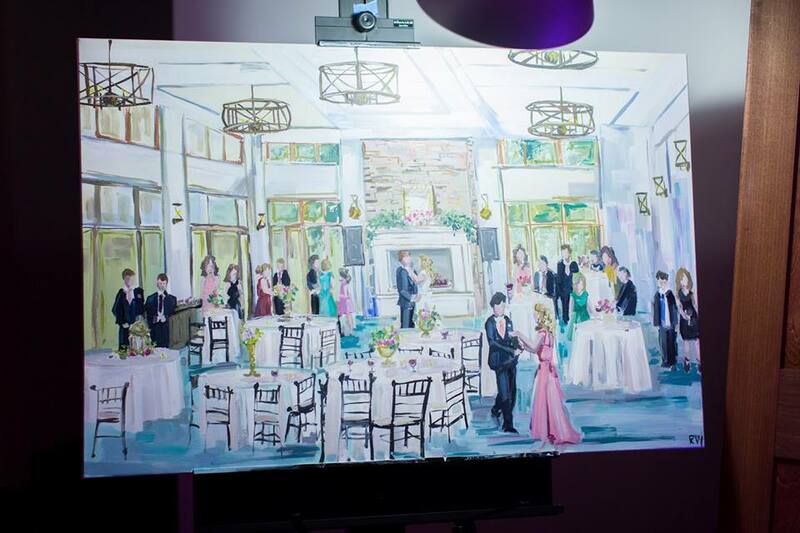 At the end, the happy couple gets to take home their new artwork that uniquely commemorates the event. Hannah Lee and Jennie Pitts, if y’all are reading this, thank you for prompting me to give live painting a try, and for sharing your support and expertise along the way. I would highly encourage taking a trip over to their websites (linked to their names above) and checking out their outstanding work!